The National Heavy Vehicle Regulator (NHVR) website has information about chain of responsibility for heavy vehicles. Safe-T-Cam is a network of cameras that monitors the movement of heavy vehicles on South Australian roads. The cameras are on major arterial roads and record, verify and store information about heavy vehicles, 24 hours a day, seven days a week. drive a heavy vehicle that is unregistered and uninsured. You are required to retain all driver records for three years and produce them when requested by an authorised officer. Failure to produce driver and operator records when requested is an offence. Penalties will also apply for offences originating in New South Wales and detected in South Australia. 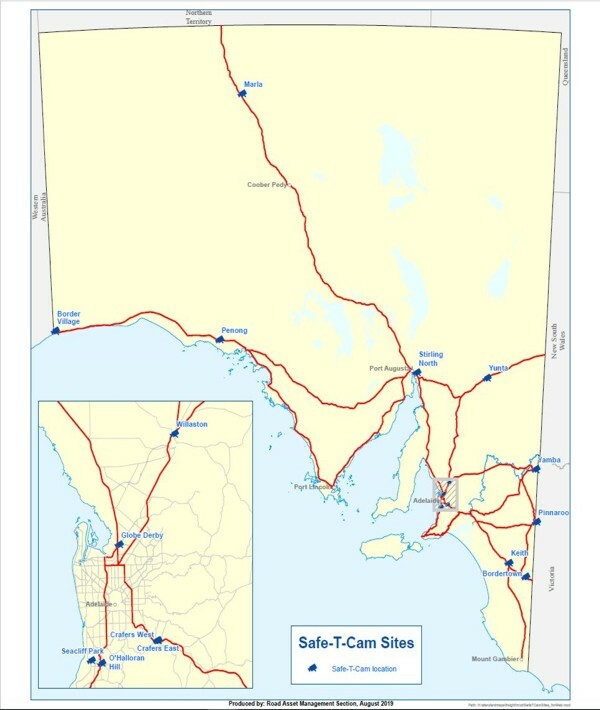 Map showing Safe-T-Cam sites at Globe Derby, Willaston, Crafers, Border Village, Marla, Stirling North, Yunta, Yamba, Pinnaroo, Kieth, and Bordertown. For more information about Safe-T-Cam camera locations in South Australia, please contact DPTI on 1300 660 279 during business hours. For more information about fatigue related offences detected by Safe-t-cam cameras, please contact the NHVR on 1300 MYNHVR (1300 696 487). The NHVR website has information about the national driver work diary requirements, work/rest requirements and where to purchase a work diary.